Dengue is the most common arboviral infection in tropical and sub-tropical climates. Clinical presentation varies from a severe flu-like illness to a potentially lethal dengue hemorrhagic fever. Various neurological manifestations of dengue include myositis, polyradiculopathy and Guillain-Barre syndrome. ,, Isolated phrenic neuropathy and diaphragmatic paralysis following dengue is extremely rare and only a single such association has been described. We report the second such patient. A 38-year-old school teacher presented with fever, rashes and generalized body pains of 4 days duration. On examination, he was febrile (102°F), with a pulse of 128/min and a blood pressure of 120/78 mmHg. The rash was macular and blanching and generalized. Petechiae were present over the thighs and abdomen. Neurological examination at this stage was essentially normal. Total platelet counts were 7,000/mm 3 and total leucocyte count was 10,200/mm 3 with lymphocyte predominance. Serology for dengue IgG and IgM was positive. Results of the liver function tests are: total bilirubin 1.07 mg/dl; SGOT 262 U/L, SGPT 85 U/L; alkaline phosphatase 318 U/L. Coagulation profile and renal functions were normal. He was given supportive care and transfusion of platelet concentrates. Within 6 days of onset of symptoms, he had a significant relief of his ailments. His hospital stay was uneventful, except for body ache, particularly along the right shoulder and interscapular region, which responded to oral analgesics. After 1 week of a symptom-free interval, he developed shortness of breath and chest discomfort on physical exertion and talking, especially while delivering lectures to his students. These symptoms were nonprogressive, but persisted for 1 month when he was re-hospitalized for evaluation. General physical examination was unremarkable and there were no focal neurological deficits. 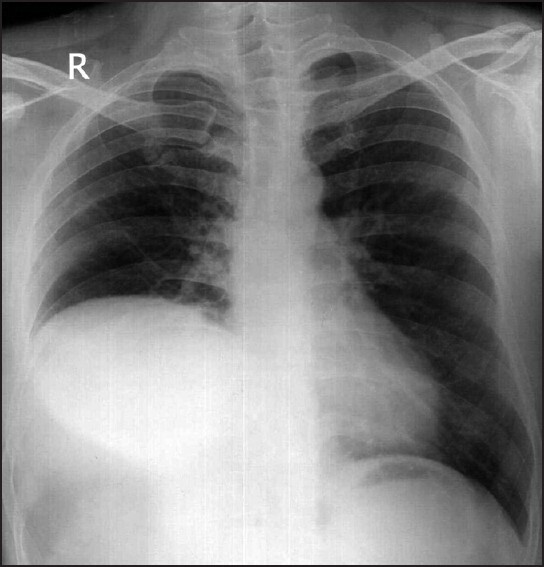 The X-ray of chest showed elevated right hemidiaphragm [Figure 1]. Fluoroscopy for diaphragmatic movements demonstrated minimal excursion of right diaphragm with no paradoxical motion on sniff test [Figure 2]a and b. Electrodiagnostic studies revealed nonrecordable compound muscle action potential (CMAP) from right phrenic nerve [Figure 3] and [Figure 4]. There was no electrophysiological evidence of involvement of other components of the right brachial plexus. The pulmonary function test (PFT) in the sitting position was suggestive of restrictive pattern. 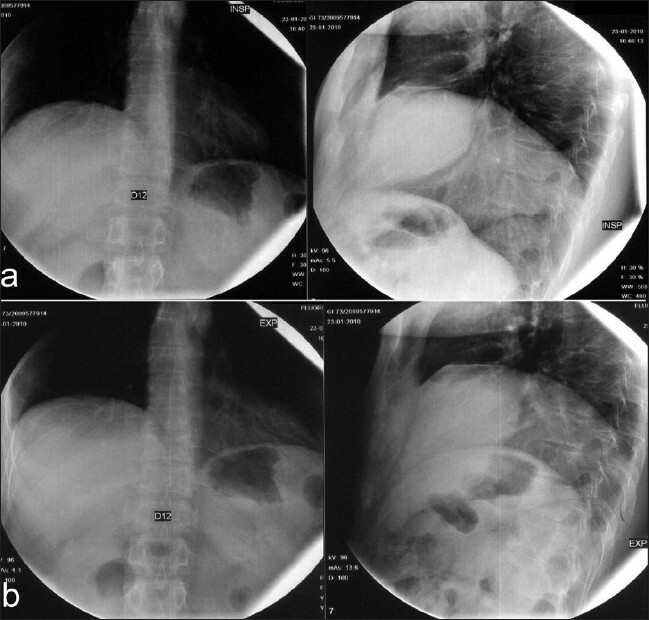 The contrast-enhanced computed tomography of thorax was normal. Post dengue, right phrenic neuropathy was considered and he was managed with oral steroids and supervised chest physiotherapy. He also received intravenous immunoglobulins for 5 days. At 4 weeks of follow-up he had significant relief in symptoms. Repeat PFTs showed significant increase in expiratory forced vital capacity and forced expiratory volume during the first second. 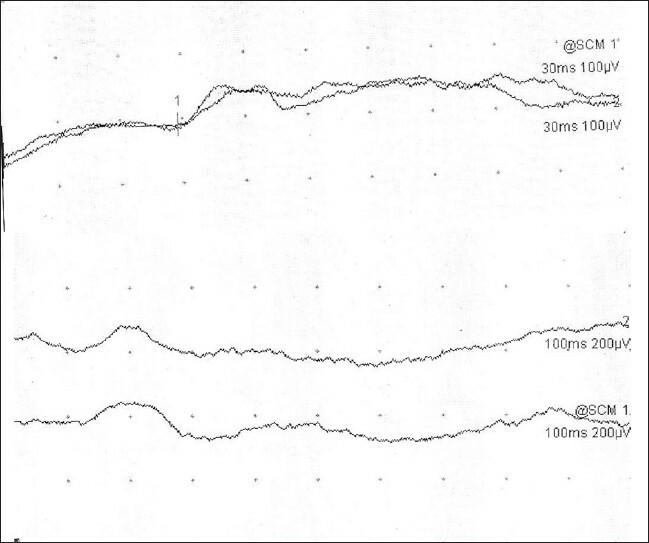 Repeat phrenic nerve conduction study showed low amplitude but recordable right phrenic nerve CMAP [Figure 3] and [Figure 4]. 5. Baum GL, Crapo JD, Celli BR, Karlinsky JB. Pulmonary diseases. 6 th ed. Philadelphia, PA: Lippincott-Raven; 1998. p. 1185-8. 10. Tsao BE, Ostrovskiy DA, Wilbourn AJ, Shields RW. Phrenic neuropathy due to neuralgic amyotrophy. 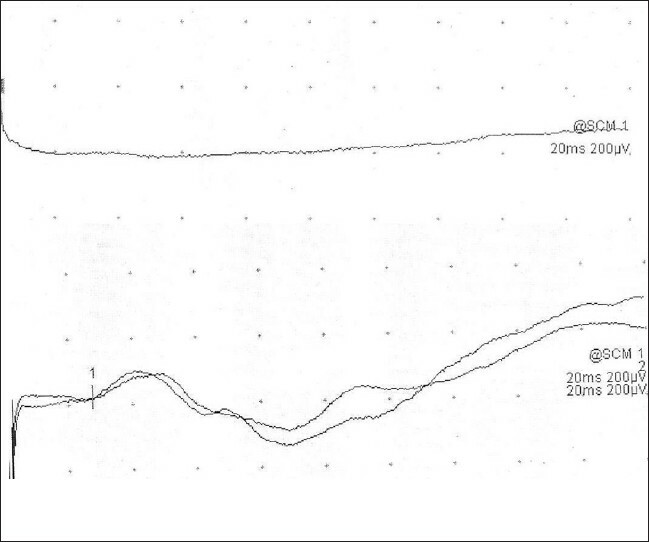 Neurology 2006;66:1582-4. 12. Wilbourn AJ. Brachial plexus disorders. In: Dyck PJ, Thomas RK, Griffin JW, Low PA, Peduslo JF, editors. Peripheral neuropathy. 3rd ed. Philadelphia: Saunders; 1993. p. 933-4. Puccioni-Sohler, M. and Orsini, M. and Soares, C.N. Shivanthan, M.C. and Ratnayake, E.C. and Wijesiriwardena, B.C. and Somaratna, K.C. and Gamagedara, L.K.G.K.